ANALYSIS: When is a recession not a recession? A prominent South African economist says the country is not actually in recession, but his argument has few takers. South Africa’s economy shrunk by 0.7% in the second quarter of 2018 on the heels of a 2.6% decline in the first quarter of the year. This meant the economy had slipped into recession, the country’s statistics office announced. Statistics South Africa added that the widely recognised indicator of recession was at least two consecutive quarters of negative growth. But economist Dr Roelof Botha countered that the country is not in a recession. He was speaking at a September 2018 conference focused on financial “disruption” and “challenging the status quo”. This is because there was more than one way to define a recession, Botha argued. According to him, the Organisation for Economic Co-operation and Development “says one should compare GDP on a year-on-year basis rather than on a quarterly basis”. The OECD, an economic grouping of 36 mainly European countries, told Africa Check it does not have an “official recommendation” on how to define a recession. Its usual definition is borrowed from the National Bureau of Economic Research, a US-based economic research organisation, an OECD spokesperson said. This defines a recession as consecutive months of declining growth, which “has been interpreted as two consecutive quarter-on-quarter negative growth rates”. Using this definition and the latest GDP figures, South Africa’s economy qualified as being in recession, the organisation said. Botha told Africa Check he wanted to make the point that statistical agencies have a choice between using quarterly and annual measures. In his estimation the year-on-year approach provides a better picture of growth. 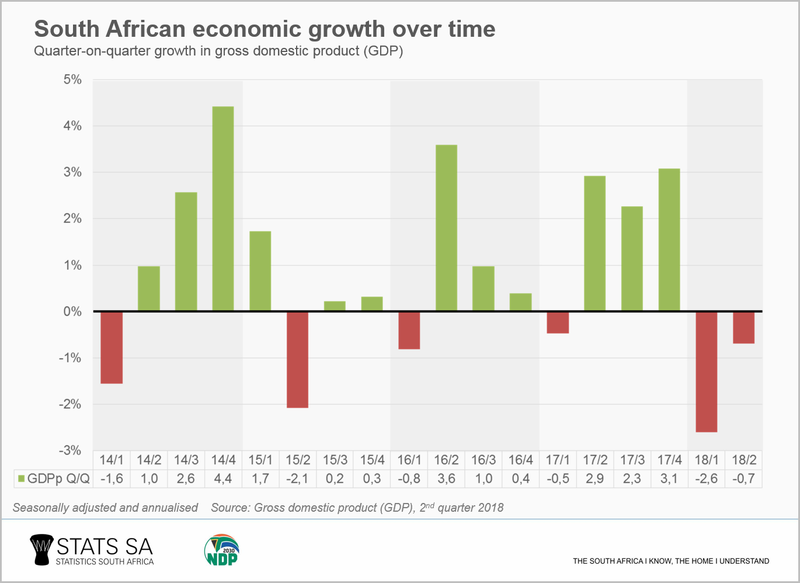 “The fact that South Africa had a rather good fourth quarter GDP performance [of 3.1%] introduces the current misconception that we are in a recession, which is not the case when doing the year-on-year analysis,” he said. Both methods had their strengths and weaknesses, but a year-on-year approach requires fewer adjustments and is better suited for international comparisons, Botha added. “Any statistical agency worth its salt will publish both rates,” he said. Focusing on quarter-on-quarter data was “a really bad choice” for South Africa given a tide of unfavourable news, such as rising unemployment and low investor confidence, the country was grappling with. Stats SA does not have a formal definition of a recession, Peter Perkins, who works in the data agency’s economic statistics department, told Africa Check. They “usually use the widely accepted convention that two or more consecutive quarters of negative growth are referred to as a recession, where growth is measured by the quarter-on-quarter change in real GDP, seasonally adjusted”. Perkins said organisations and individuals do have a choice of how to define a recession, but the year-on-year approach posed a risk. “A problem with using the year-on-year rate is that year-on-year growth in GDP may be negative at a time when GDP is recovering (i.e. showing positive growth quarter-on-quarter). You then have the risk of saying there’s a recession at a time when the economy is actually recovering,” he said. Prof Jannie Rossouw is head of the economics and business sciences school at the University of the Witwatersrand. He told Africa Check that the “accepted definition” of a recession is that of two consecutive quarters of negative economic growth. He also did not agree that the year-on-year approach was more stable. Statistical agencies do have a choice of giving either, Rossouw said, noting that Stats SA had done this with its most recent data. The bigger challenge for South Africa was that the economy has perennially underperformed and not enough jobs have been created, Rossouw said. If population growth outpaced economic growth then a country is actually becoming poorer, Rossouw added. South Africa’s recent economic performance qualified as a technical recession, Razia Khan, Standard Chartered Bank’s chief economist for Africa, said. But there might still be good news for South Africans, Khan said. Additional research by Gopolang Makou.